Looks like one black hole is having its own Thanksgiving feast. Scientists have stumbled upon an amazing sight: a black hole murdering a star, and burping it back out. 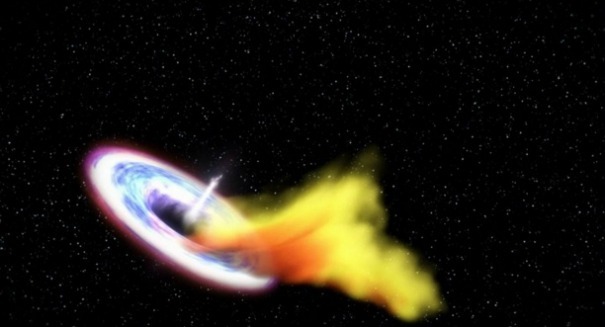 It’s not the first time a black hole has been captured pulling a star to pieces, as they are known to do, but this new study may have just captured a phase of it never before seen, according to a Washington Post report. The reason this particular black hole is different is because the scientists are witnessing a hot flare of matter escape from the black hole, almost like a “burp” after the black hole had gobbled up its own Thanksgiving dinner. The study, published in Science, could be the first time someone has picked up the radio signal of escaping matter from a star that has been swallowed up by a black hole. Scientists have seen such jets of matter, but never have they directly linked it to a specific star being ripped to pieces. It’s an important discovery as scientists don’t know a lot about the phenomenon. The star and the black hole gobbling it up are at a safe distance of 300 million light years away. The star is about the same size and type as our own, and the black hole is the supermassive kind typically found at the center of galaxies like our own. The amazing sight was captured by Ohio State University scientists with an optical telescope last year. Researchers at the University of Oxford used a number of different telescopes to gather more information about the event, and scientists hope to discover more about the phenomenon and thus come to a greater understanding about it.